A: Wei, MJ you know MJ? A: Neh, that one ah, Michael Jackson know Michael Jackson? B: Oh! Michael Jackson ah… Who woh? A: Neh that one very geng de ah… Black can become white de ah. B: Oh oh… that one! Why? B: Har? What die liao? A: Michael Jackson die liao!!! B: Wei, but he very famous de hor, so everybody very sad loh! B: But why you look more happy than sad? B: And why he die de ah? A: Some sort of heart attack. B: Oh! Call him not to suka suka change his skin de colour de lah! B: But related to heart attack meh? B: Eh, OH!!! I know why he will heart attack die de lah. A: Later i gotta download all his songs, see why he got so much fans around the world. B: People just die you go and download his song illegally…. A: Those alive one i aslo download their songs illegally lah! B: Eh, ya hor. But from where you download woh? 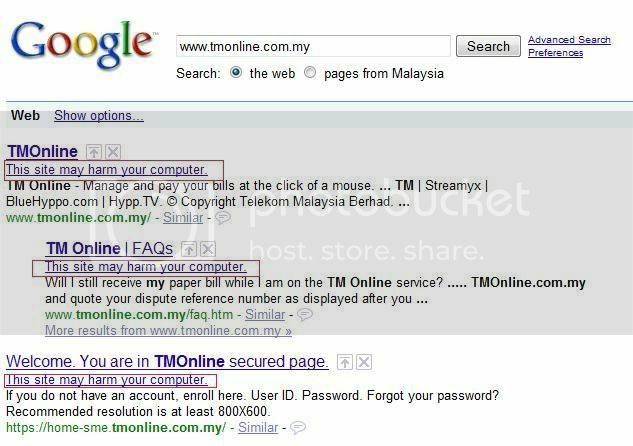 A: Internet lah. There people sure got gather all his album and put for download! Wakaka, gotta clean my disc space ready for that 1st. B: Hm… seems internet de people do things very efficient de. A: Not only internet de people, the Sony BMG also do things very fast de. B: Why you say so? A: See! (Refer to this link). Less than one day people die already ready to publish an album liao. B: Wow… So geng… Seems like they know he is going to die very soon… everything is prepared. A: Ya loh. And it will be selling in shop on the 30th June! A: See can make money from dead people. B: Ya loh… dunno MJ will go to heaven or hell meh? A: Is this your business meh? WARNING: Visiting TMOnline.com.my may Harm Your Computer! Google Search say: You better NOT! Maybe is because they cheat too much!?!?! Or the service “Screamyx” they provide too lausy and not fair? So Google as well as firefox avoiding you become the next person who sign up screamyx. *NOTE*: Its not safe if you try to view that page except you are very sure you have your firewall, and anti virus running well. Or else, DONT TRY THIS! Cos when i try, i get this alert from my Anti-Virus! What is the current listing status for tmonline.com.my? Of the 3 pages we tested on the site over the past 90 days, 2 page(s) resulted in malicious software being downloaded and installed without user consent. The last time Google visited this site was on 2009-06-25, and the last time suspicious content was found on this site was on 2009-06-25. Malicious software is hosted on 1 domain(s), including gianthighest.cn/. This site was hosted on 1 network(s) including AS4788 (TMNET). Over the past 90 days, tmonline.com.my did not appear to function as an intermediary for the infection of any sites. Thanks for hackers maybe to give TMNet a lesson to improve their service! p/s: I had written this cos i fail to get into university. 我以伤心到不会再伤心了。what is my future, i dont know. I hope and know He will still lead my way, plan my future. He is my only hope.